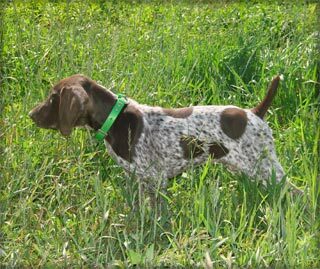 At Top Secret Kennels, our breeding is limited to German Shorthairs but we have extensive experience with most major pointing breeds. Our training methodologies have been developed over years of working with some of the most well-known and successful pointing dog trainers and kennels in the United States. We've taken what we learned and have refined it to fit our own training style as well as to fit the characteristics and traits of both our own, and customers', dogs. We will customize our program around you and your dog's specific needs. 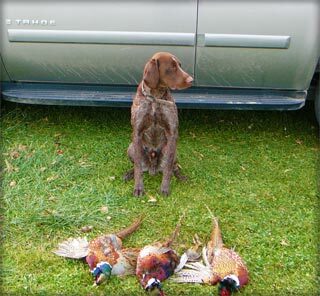 We offer all levels of training from basic introduction to a finished Master Hunter. To maintain a high level of quality, however, we do limit the number of dogs that are put through our program. This ensures that we give your special companion the one-on-one time that is needed. Every dog that visits our kennel is treated as if they were our own. Following are a few of the highlights of the Top Secret Kennels training regimen. We believe that dogs come to us with varying degrees of desire to please and our training methods reflect this. Our training philosophy is that simplicity and consistency will be the keys to success in helping each dog reach the training goals that are established based on your personal preferences for your dog. These are some of the basic commands that we teach every dog that comes into our training program and are considered essential training for pointing breeds. Training on the basic commands generally can start as early as 8-10 weeks of age. While this is not a full list, it provides a general idea of some of the basic training requirements. Our basic level training also includes introduction to gunfire and most of the basic equipment your dog would encounter as a household or hunting companion. Our Intermediate Training includes a number of additional commands you may choose to teach your dog based on the level of proficiency you expect him to achieve. 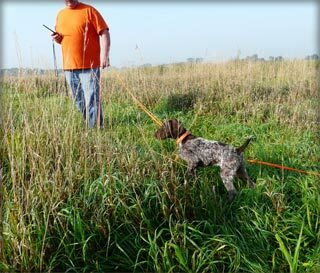 In many cases, our Intermediate Training includes a great deal of shaping and refining behavior that comes naturally to a pointing dog through genetic traits. 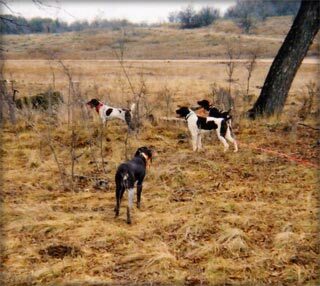 A pointing dog that succesfully completes Basic Commands and Intermediate Training in our kennel will meet most of the requirements you would look for in a solid household or hunting companion. If you have special requirements based on your personal needs, we can also work them into our program at the appropriate time based on the dog's age and progress. This is for those owners who absolutely must have a high performance canine machine for hunting and competition. Dogs trained to this level represent the highest level of achievement in pointing dog proficiency and will be prepared to compete and win at both regional and national levels. It's important to note, though, that if you want a dog trained to this level, you really need to make the commitment early on in your dog's training program. When bringing your dog to our kennels for training, it's required that you bring the following items. We will evaluate your student on an ongoing basis and keep you informed of the progress that is being made.